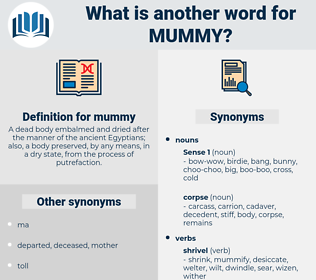 What is another word for mummy? 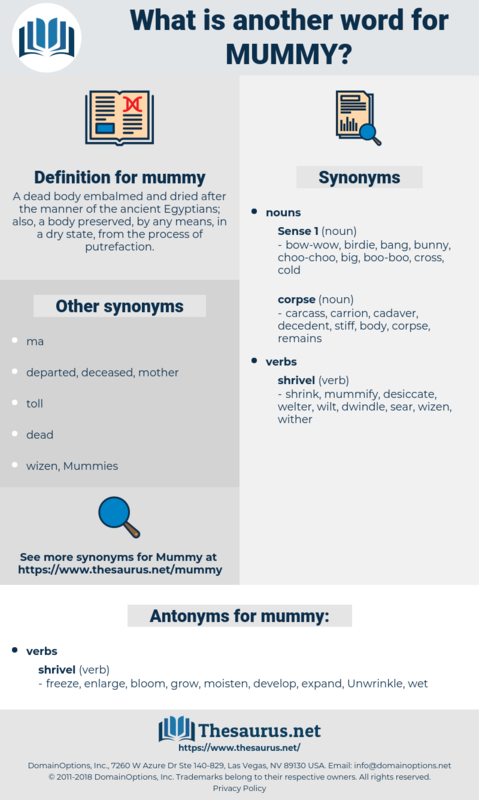 A dead body embalmed and dried after the manner of the ancient Egyptians; also, a body preserved, by any means, in a dry state, from the process of putrefaction. freeze, enlarge, bloom, grow, moisten, develop, expand, Unwrinkle, wet. Mummy wouldn't let me if I wanted to. This must be true, and he would be a mummy indeed if she couldn't wake him up. mane, moon on, memo, mahoe, man, mem, muon, meany, mya, minim, minion, may 24, mm, mammy, mom, mayhem, menominee, meme, mahimahi, menu, mini, maui, money, maine, mew, mamma, mahayana, M, mamo, mi, mamey, mahan, m3, M.M., mow, mao, mammea, mannheim, mayenne, mien, ma, monomania, moynihan, moon, min, mine, maoi, me, minah, m2, mahonia, mimeo, maya, moan, mania, miao, mon, myna, miami, mown, mona, maha, m1, miaow, many, meanie, moo, Moho, meow, mammon, monoamine, maia, men, moneyman, momma, minimum, muumuu, many a, minium, mn, menomini, miaou, minnow, mayhaw, mean, mommy, mum, many an, manannan, may 1, mann, mnium, Moonie, m-1, moue, mayan, maim, mooneye, manama, main, manna, mummey, mynah, moony, maw, 8 May 1945, mho, mammee, mina, mam, myoma, mym, mayo, mama, moa, ma'am, mu, mei, Minyan, minoan, mime, mo, mono, menuhin, may, may wine.